Milkybar - Do You Remember? Milkybars were great when you were a kid; because they were white chocolate (and very thin) you were often able to sweet talk your parents into letting you have it at times when you wouldn’t normally be allowed sugary stuff. Well, it’s not proper chocolate really, is it? According to the Nestlé website, ‘Milkybar is the No. 1 White Chocolate brand.’ Impressive claim (although to be fair, what other white chocolate brands spring immediately to mind? Exactly) and it was definitely a favourite amongst kids when I was little. Known as Milkybar in the UK and Ireland, Spain, Kuwait, South Africa, Australia, New Zealand and India, it is also recognised under the slightly less palatable moniker Galak in the rest of continental Europe, Ecuador and Brazil. Interestingly, in a few places – Australia and New Zealand in particular – Milkybar is made without cocoa butter and isn’t marketed as chocolate. I would have thought that made it even easier to get it past Mum and Dad just before teatime then…! 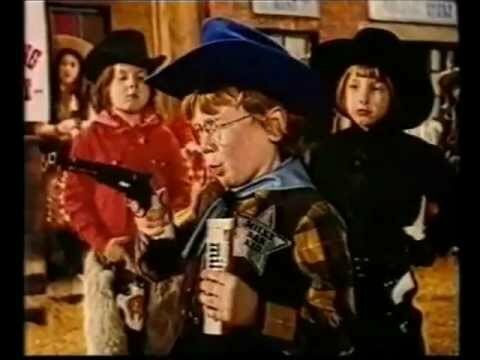 So in the vast majority of the adverts the Milkybar Kid appears with pockets full of chocolate to save the townspeople/spaceship crew (all played by other small children) from a mischievous sheriff or alien before gleefully shouting his catchphrase ‘The Milkybars are on me!’ and producing some chocolate from a convenient pocket. Most of the adverts were fairly innocuous, although one contained a slightly disturbing scene where each aforementioned sprog is eagerly toting a pistol. Hmm…lethal weapons and chocolate…what a lovely image for our little ones Nestlé! The Milkybar Kid first appeared in 1961 (played by Terry Brooks) and has always, traditionally, been played by a boy; he saves the day and receives all the attention, whilst the girls in the commercials were merely there to gasp ‘It’s the Milkybar Kid’ and look adoringly at him. Thankfully this was finally turned on its head in 2010 when Hinetaapora Short beat 1500 other applicants to become the first ever female Milkybar Kid; thus becoming my second-ever favourite. My favourite of course is Simon Pegg. He didn’t appear in any of the adverts but he played the adult Jonathan Pearce, who is the fictional ‘original Milkybar Kid’ in a 2005 Comic Relief sketch. He’s interviewed by the legendary presenter Alan Partridge (Steve Coogan in blisteringly casual attire) in what is meant to be a light-hearted look back on his time as the famous character but rapidly spirals into a humorous/depressing expose of the catastrophe that his life has become since he was 12, culminating in his near on-stage breakdown. Maybe a sugar-hit would have helped…shame he didn’t have any Milkybars on him. The Milkybar range started as just one small bar in the UK; obviously now it comes in many forms, including Buttons, Giant Buttons, hollow figures (owls, cows, bunnies, polar bear cubs and – er - ghosts), Easter eggs and Mini Eggs, not to mention various other incarnations across the globe. In 2009, according to Nestlé, over 1.7 BILLION Milkybar Buttons were sold; imagine how big a pockets the Milkybar Kid would need to shout ‘The Milkybars are on me!’ if he was delivering that little lot!